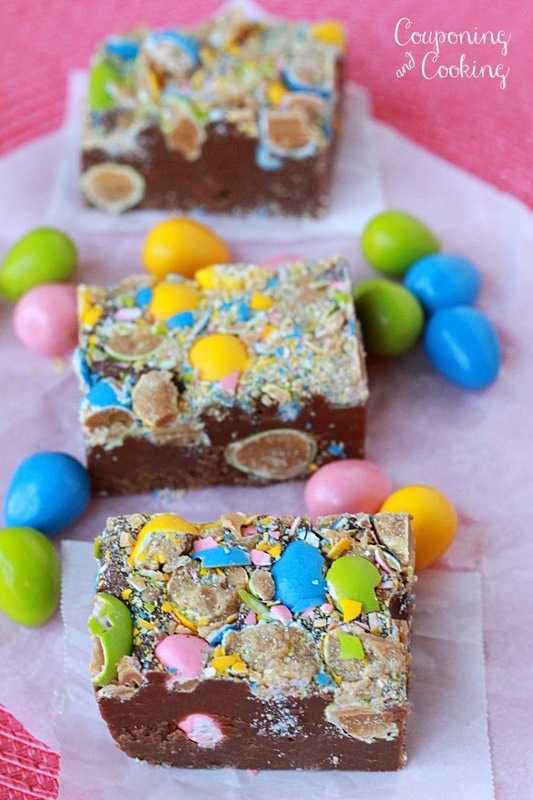 Creamy chocolate and crunchy Reese's Pieces Eggs join together to make the perfect fudge! I know what you're thinking, 2 and half years without a single fudge recipe on this blog and now I am posting two in a row? I get it, it's strange. I have only made fudge once in my life before this past week and now I have made it two times in 7 days. And that is because I am obsessed with this basic fudge recipe. I got the idea from Lisa at Wine & Glue she makes delicious looking fudge like it is her business (and I guess it kinda is...) and she usually uses a base of some type of chocolate or butterscotch chips melted with sweetened condensed milk. 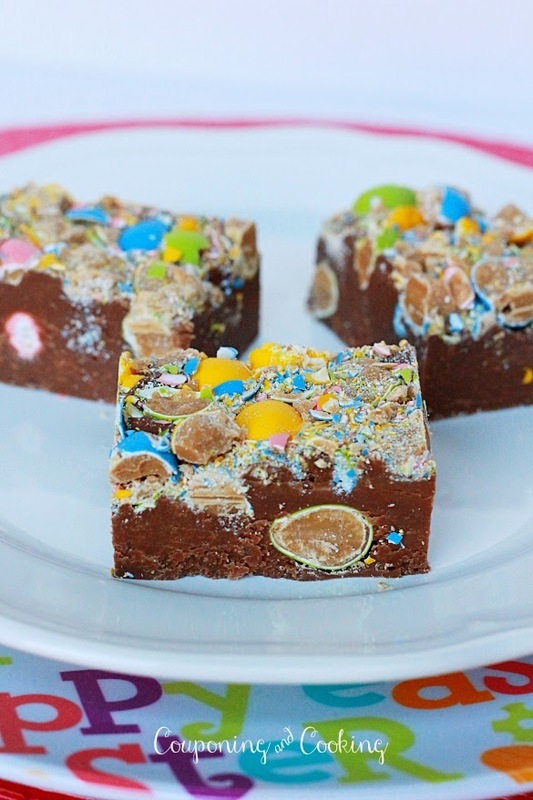 I tried it for the first time with my Mint M&M Fudge for St. Patrick's Day and now I want to make it one million different ways. 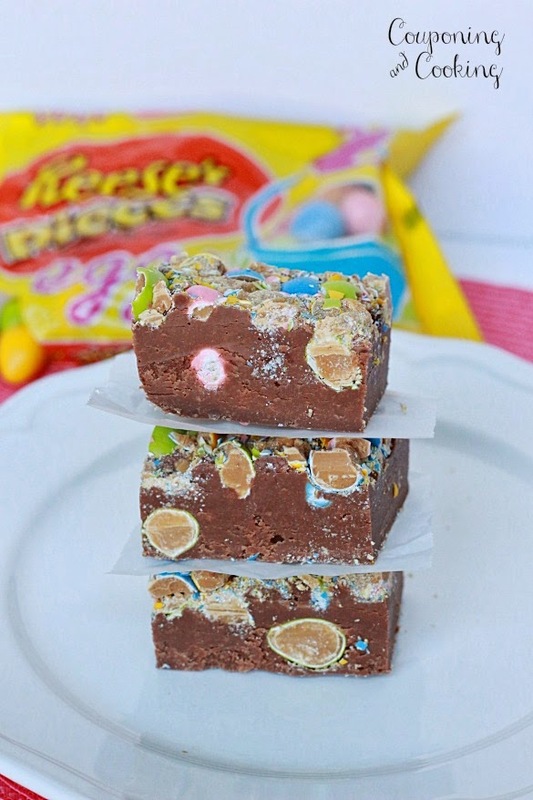 First up, this Reese's Pieces Egg Fudge. Talk about way too easy to taste this good. I can't think of a better combination that peanut butter and chocolate except for maybe Reese's peanut butter and chocolate. Personally one of the best things about Easter is the arrival of Reese's Peanut Butter Eggs on grocery store shelves. And for what ever reason, this is the first year I have seen the Reese's Pieces Eggs. How did I miss this? Someone tell me they are new this year because if not I have seriously been missing out. I consider myself somewhat of a seasonal candy connoisseur and I don't know these never made it into my Target shopping cart. And so the moral of the story is, I have a lot of making up to do in the kitchen. 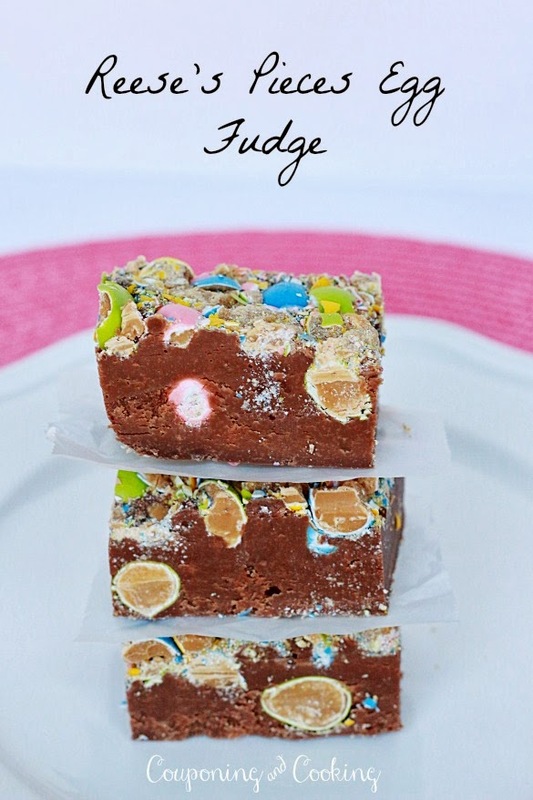 I have a feeling that my life is going to be full of nothing but fudge recipes and Reese's Pieces Eggs recipes over the next few weeks. 1.) In a saucepan or in a double boiler combine the chocolate chips and the condensed milk. 2.) Stir on medium heat until chocolate chips are completely melted and combined. 3.) Turn off the heat and pour half of the mixture into a 9x9 pan lined with tin foil. 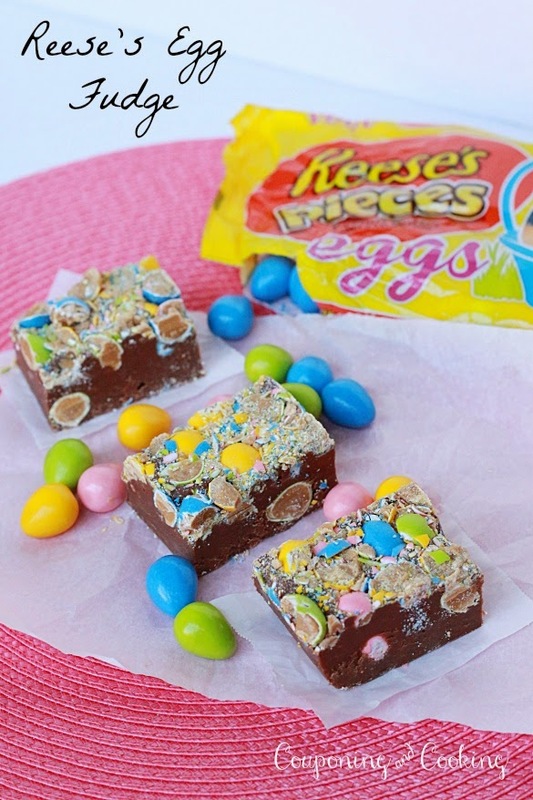 Scatter the 20 whole Reese's Pieces Eggs over the first layer of fudge. 4.) Top 1 cup of crushed Reese's Pieces Eggs. You may need to press them down into the fudge so that they stick. 5.) Refrigerate overnight or for at least 8 hours. 6.) Pull the foil edges up and use the foil to remove the fudge from the pan. Cut into squares to serve. Be sure to store leftover fudge in the fridge so it doesn't get melty. Enjoy!